First, it’s important to know that a tax extension is actually quite easy to get. It requires only a single form, and as long as you fill out and submit the form correctly, the IRS almost never rejects a request to extend. So, if the prospect of filing your full, complex tax return within the next two weeks is a little overwhelming, requesting an extension is something that we can do for you quickly and easily. 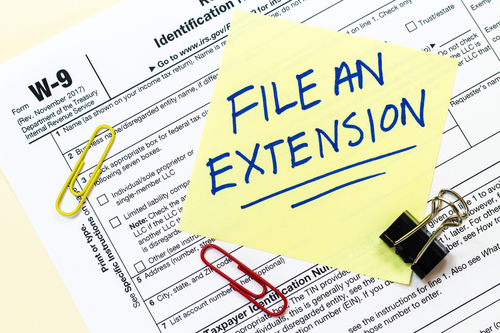 A tax extension gives you an extra six months to put all your tax documents together and filing your full return. So, your new tax filing deadline would be October 15th. However, it’s important that you still file as soon as you are able, rather than delaying until the last minute. There are no additional extensions, so if you miss the October deadline, you’ll start incurring late filing fees. One common misconception about tax extensions is that they’re an easy way to delay paying on your tax debt. This is not true. A tax extension only extends your deadline for filing your return; you are still expected to make a tax payment on or before April 15th, regardless of whether or not you have chosen to extend. This means that, even if you don’t have all the paperwork needed to file your return yet, you will still need to calculate the amount you believe you will owe on your return, then pay that amount to the IRS when you request your extension. If you don’t submit a payment with your request to extend, your request could be denied, and you’ll find yourself paying late payment fees and interest on the amount you failed to pay. If you don’t owe on your taxes, and simply need a little more time to file, you don’t need to worry about this. Calculating what you owe when you don’t have all of the necessary documentation can be difficult, but our expert tax preparers can help ensure this is done properly, so that you can make an accurate payment when you request to file. As mentioned above, if you are expecting a refund, you don’t need to worry about making a payment when you file your extension. However, please be aware that you won’t get your refund until after you file your full return. So, if you’re relying on that refund to pay important bills, you should probably do your best to file by the deadline. Or, at the very least, extend and then file your return at the earliest possible time. While an extension is a great way to take some of the pressure off and get more time to gather your documents, it shouldn’t be your go-to solution to put off filing. In the long run, it can end up costing you more money if your estimated payment is inaccurate. So, if you are able to file, don’t use the option of an extension as an excuse to procrastinate. Simply gather your documents, contact one of our CPAs, and get your return filed as soon as possible. On the other hand, in many cases, the extension option can offer many benefits. Not only does it give you more time to file, but it can help ensure you are getting all of your qualifying deductions and exemptions. If you feel the need to rush out your tax return, you could make mistakes and overlook certain deductions. When you have a little more time (and a professional’s help), you may be able to catch certain items on your return that will help you to save money on your tax bill. If you’re feeling the heat with the approaching deadline, contact one of our CPAs to discuss your options, and whether or not a tax extension is the best option for you.